American Girl dolls are great, I always love the positivity the brand promotes. Newly re-introduced late last month, I am absolutely loving the new world American Girl has brought to the masses, BeForever. What is the significance of the BeForever line? They are a collection of historical dolls, books and accessories that connect girls living in the world today with inspiring characters and timeless stories from America’s past. So girls are able to find their place in the present, explore the past through these characters, and thing about the possibilities the future can bring. How inspiring! I am a big history buff and feel it is so important for young children to learn about history. It’s not just names and dates, there are lives, experiences, dreams and events that took place, not too different from our own. It’s so cool to me that American Girl doll recognizes this and wants to influence young girls for good. The BeForever line of dolls include eight girls, each from a different place in history. Kaya, Caroline, Josefina, Addy, Samantha, Rebecca, Kit, and Julie. Each of their stories are different, yet, each one shows girls the shared interests, shared challenges, and shared dreams that tie children from all times together. In addition to the dolls, each has their own book to help girls learn more about their lives. Newly introduced this year is a new book series called BeForever Journey Books. These are for girls that love adventure and brings the characters to life in a relatable way. 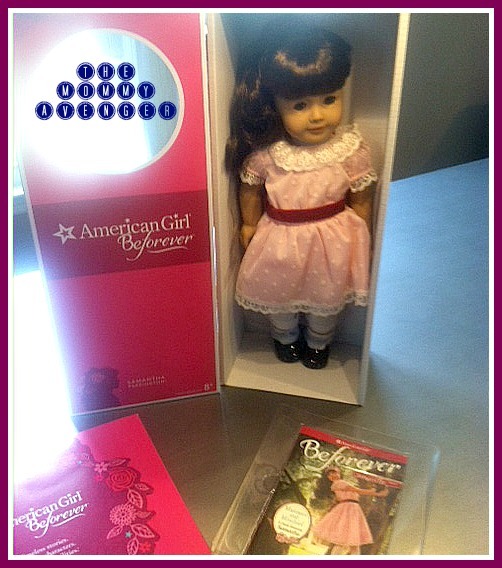 As part of the reintroduction of the BeForever line, American Girl favorite Samantha has been re-released. She first appeared in 1986 and now girls today can enjoy this gorgeous doll and her heroic story. I received one of these dolls to check out* and she is just as great as other dolls from American Girl I have had the pleasure to see. Samantha Parkington has beautiful shiny chestnut brown hair and dark brown eyes that sparkle. Dressed in a light pink dress adorned with lace, mesh fabric, and red sash and adorable black Mary Janes, she looks the part of little girl from 1904. She even comes with a necklace and red velvet purse! She is so sweet! I love the high quality of American Girl dolls and this newly released Samantha is an update on a classic doll, beautifully done. You can find more about Samantha Parkington by visiting American Girl online. Now is a great time to pick up this sweet doll, as the holidays are just around the corner! I had an American Girl doll when I was a little girl. Now I have all boys, so there are no AG dolls in my future. HAH! Yeah, it does. If you ever do have kids, you’re going to be amazed at the stuff they get into. It’s nice that they have the doll that also ties in with their heritage. Girls could learn a lot from the stories of this doll. My niece was into American Girl dolls when she was younger. She carried her doll with her everywhere. I had American Girl dolls before they were bought out by Mattel. It was a small company in PA I believe. I asked for a Bitty Baby for Chrismas, but Hurricane Andrew hit. So many of my friends didn’t get a Bitty Baby, but I got mine (good planning on my moms part or luck, Im not sure). I wrote a thank you letter to the company and they sent back a hand written note and 2 outfits! Such an amazing company. I have a feeling American Dolls are going to be all the craze this Christmas. Beautiful doll. My daughter had one when she was younger. I love the American Girl dolls I got my first on when I was a little girl I had to save up all my money because my parents would not buy it for me. What a pretty doll, my great niece would just love it. Coming out just in time for Christmas. I’ve always wanted to buy my daughter a American Girl Dolls but they are just not in my price range. I’m fond of playing with dolls even now as an adult. My sister will surely like these AmericanGirl dolls. We actually got an American Girl catalog not that long ago & I noticed this line of dolls. I thought it was wonderful how they included history into such a simple thing like a doll. I love American Girl dolls, they are a bit pricey, but worth the money. Even though I am not a child I could dress them up and play with them all day long. They are high quality and lovely stories to tell. I have to check out this new line they have launched. I am so excited to have a granddaughter now. She and I will be exploring the American Girl Dolls at some point in the near future (she’s just one now). Such an adorable toy.. I never heard of this brand before.